Oum El Dounia translates to "Mother of the world" which is an Arabic nickname given to Egypt. 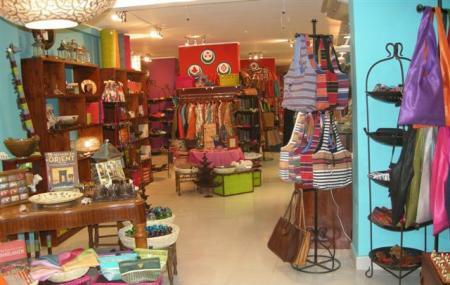 The charming gallery is a myriad of colors and a wide collection of books and handicrafts. The gallery also works with NGO associations. The gallery can also be looked at as a commercial space where you can buy authentic Egyptian handicrafts at reasonable prices. So buy a souvenir or take home some gorgeous stuff for your interiors, Oum El Dounia Gallery provides with everything that looks artistic. How popular is Oum El Dounia Gallery? People normally club together City Of The Dead and Nile Dinner Cruise while planning their visit to Oum El Dounia Gallery. We were looking for gifts to bring home and found the best ones here from out whole trip through Egypt. The quality so much better than what you see at tourist stops. Excellent handmade products. It was hard to pull myself out of this place. Thank you so much for your kindness.